My Favorite Language apps by Mobile Education Store! Well, with the time off during the Thanksgiving weekend, I thought I would blog again. I have decided that I am not a very consistent blogger. I am a good “website keeper-upper”, but my blogging frequency needs help. Sorry about that everyone! I will definitely try to do better for you all! With that said……. 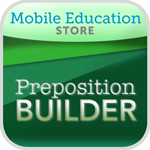 Preposition Builder™ is designed to help students learn receptive and expressive use of prepositions. There are 9 story preposition modules teaching 28 common prepositions that gradually unlock elements to an ongoing story. I have used this with several of my kindergarten and 1st grade high functioning autism spectrum learners as well as language delayed students. All of my students are crazy about this app! They love the drag and drop element, and I love the auditory feedback, visual cues provided by the well designed pictures and the written word to support early reading development. At $7.99 (as of this blog date), this app is a MUST-have for any SLP, primary special education teacher, early childhood program, or preschool. Story Builder™ is probably one of my top five favorite apps of all! I use this app every single day with my students. There are 3 levels of play where a student records his/her own voice to describe a picture or answer a question given a prompt. The student’s responses are chained together to develop a complete narrative. There are over 50 story lines and over 500 audio clips of questions to guide the narrative development. I have personally found this app helpful for students who struggle with written language, as well as a venue to provide continuity of service between myself and a special education teacher who may be supporting written language learning goals. 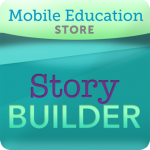 During the learner’s speech-language session, he/she would plan, create and record an oral narrative of a story with the Story Builder app. Then, we create a story map outlining the characters, setting, and plot elements (beginning, middle, end). The student can then take the storymap, or even the iPad with the recorded story to his/her other teacher to produce the written narrative. This is an excellent app with immense value at $5.99. 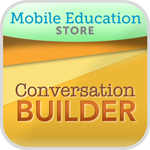 Conversation Builder™ is a conversation simulator designed to help elementary aged children develop conversational turn-taking, topic maintenance, and question-asking skills. As an SLP who focuses a large portion of time supporting social/emotional skills for elementary-aged learners, I can tell you – there is no other app like Conversation Builder. This app is truly in a class of its own! I have spent hours and hours searching apps and websites for tools to support conversation skills. I have not found ANYTHING even close to the quality that this app has. Students can participate by recording their voice in the conversation exchanges in one-on-one or group scenarios. Users can choose between a 4 exchange conversation or an 8 exchange conversation. This app also has components to customize information about the student’s name, age, where they live, and interests. The app features over 160 conversations with the ability to save conversation recordings. I have been using this app most frequently with a 4th grade young man on the “higher functioning end” of the autism spectrum. I really appreciate how this app includes subtle conversational cues such as tone of voice, and even formal versus informal manners of speaking which can greatly impact conversations. There are multiple levels of prompting – I find my 2nd and 3rd graders typically use the multiple choice options of Level One, and my older students and learners with Asperger who are working on more complex conversation skills use the open ended response and the student-initiated settings. $7.99 at the iTunes store. Option for in-app purchases of various themes/topics. Language Builder™ is yet another invaluable app for any SLP or elementary teacher! This is a wonderful app to support expressive language development for students working on pronouns, verb tenses, auxiliary/copular verbs, etc. Students create sentences with varying levels of prompts and they are recorded by the app. The recording quality on my iPad2 is so crystal clear that I have also used this app with articulation students who are working on application of their speech sounds in sentence contexts. The recording feature lends itself well to these students listening to their own speech or language structures to self-monitor. This app is more than worth the reasonable price of $5.99. I hope everyone can check out these apps – they are available for the iPhone or the iPad. Check out three more apps: Sentence Builder™, Question Builder™ and Speech Journal™ from Mobile Education Store. I own all of these apps, and use them daily. If you are an SLP or teacher embarking on the world of educational apps, these apps should be a top priority!